Up to 4 players can compete simultaneously, with players taking on the roles of breeder, trainer, jockey, and owner of a thoroughbred racehorse. 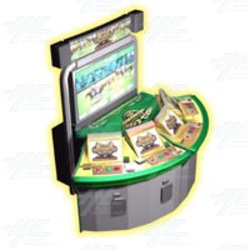 This version comes with a 60 inch LCD screen and the player stations positioned in a 'Horse Shoe' shape. For more information about this product, please review this link.